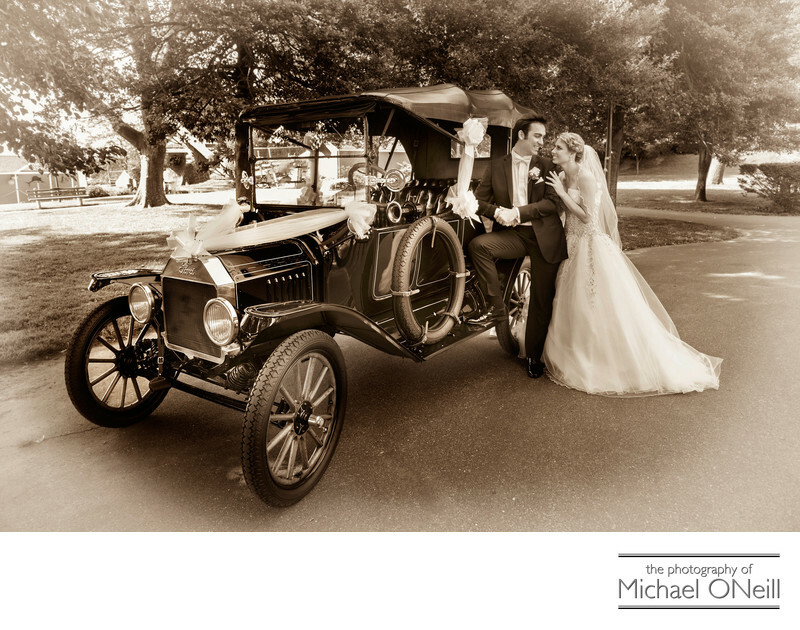 The transportation you use on your wedding day is a very important consideration. It can start the most contemporary stretch limousines equipped with their own bars, stereo and video systems and nightclub style lighting. Many of my bridal couples opt to travel with their entire bridal party on luxury touring buses. Many even provide bus transportation to local hotels so that their friends and family don’t have to concern themselves with driving after dancing the night away at your wedding reception. Vintage cars are very popular and the one pictured here is probably one of the oldest cars I’ve ever seen at a wedding. What really made this car special was that it was owned by the bride’s Uncle who acted as the chauffeur for the day. It was wonderful to see the bride and her father arrive at St. Philip Neri RC Church in my home town of Northport, NY in this amazing old car. After the wedding ceremony the bride and groom travelled in this fine automobile to the Village Park at Northport Harbor for pictures with their bridal party (who followed behind in their luxury limousines). I finished this image with an old-fashioned sepia toning effect and light vignetted edges for a classic look.